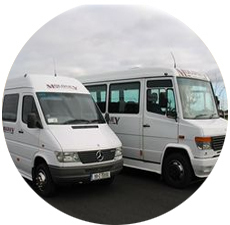 Moloney Coaches specialise in Airport and Ferry Transfers, Day Trips, Sporting Events, Social Functions, Golf Outings, Weddings and other Corporate Hire. Moloney Coaches is a very clean and comfortable bus service. 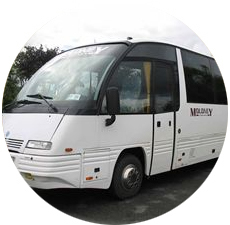 Their buses arrive at the requested time and provide a very reliable and professional service at a competitive price. All drivers are very experienced, courteous, and it is a pleasure to travel with, a bus service that is always happy to give names of some very large corporate clients who continue to use this services on a regular basis. 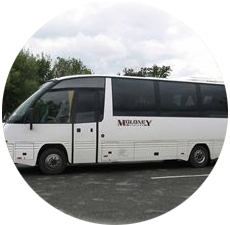 Moloney Coaches, Dublin provide mini coach hire for day trips, tours and airport transfers, from suburbs to the city centre. Air Conditioned, Reclining Seats, Seat Belts and Arm Rests, TV/Video & PA system, Reading Lights, Carpets/Curtains, and Tinted Windows, have trailers available for transport of extra luggage, golf clubs, etc., if required and what not in this exclusive bus service will you find.